Now that Halloween is over (tear), it’s time to clear out the leftover candy–and fast! No need to keep that bowl of candy around. We all know it will sit there saying, “Come hither” until it’s all gone. And no one likes a candy coma (or not being able to button their pants). Since it feels wasteful throwing it away, why not make use of your excess candy? 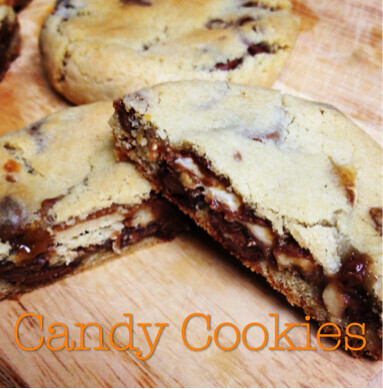 Bake it into cookies to share with friends or bring them into work for a mid-day treat! Basically, pick your favorite candy bars, wrap them up in classic chocolate chip cookie dough and 13 minutes later you’ve got gooey, delicious melt-in-your-mouth (and maybe your hand) cookies. 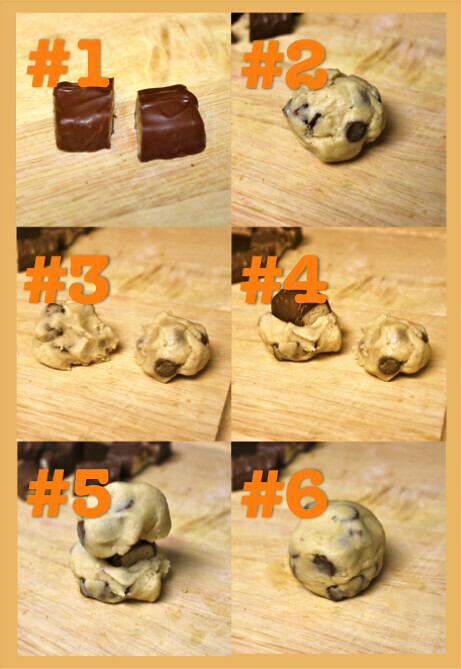 Below are instructions on how to bake candy bar cookies inspired by this recipe from Food.com. Happy baking! Line baking sheet with parchment paper (this is going to get messy). In a medium bowl, cream butter and sugar until fluffy. In a large separate bowl, combine flour, salt and baking soda. Gradually add the wet contents of medium bowl into the flour mixture, mixing slowly. Mix until all ingredients are well incorporated and then fold in the chocolate chips. Using an ice cream scoop, scoop out dough and place half of the scoop on top of halved candy bar. Take the other half of the dough scoop and place it below the candy bar. See photo instruction above. Take the sandwiched candy bar and roll it in the palm of your hand so the entire outside of the candy bar is covered and sealed with cookie dough. See photo instruction above. Place rolled dough onto cookie sheet and bake for 9 to 14 minutes. Check on them at 8 minutes though and continue baking based on your liking… I only baked mine for about 9 minutes since I prefer my cookies a bit more gooey. Once they are baked to your liking, remove from oven and let cool for 5 minutes before transferring to a wire rack for cooling. Serve with a tall, cold glass of milk and enjoy! Personally, my favorite candy is heath bars (which would be great with this recipe).